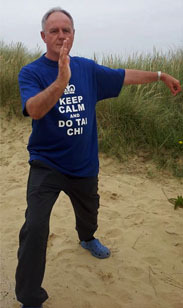 Relax in Sussex with Horsham T'ai chi & Reiki. Clear emotional and physical blocks to maintain a balanced Mind, Body, And Spirit Relax in Sussex with Horsham T'ai chi & Reiki. Clear emotional and physical blocks to maintain a balanced Mind, Body, And Spirit. Horsham Tai chi & Reiki is part of S.E.M.K.A. Wado Ryu Karate. With us you can learn & practice Tai Chi, Tensho Chi, Spiritual Healing, Reiki and Meditation. I hope you enjoy my website and I'd love to see you at a class soon. If you have any questions please feel free to contact me. For a Reiki Course please phone Paul Elliott Reiki Master/Teacher. Member of the Reiki Federation. We now run a full time Reiki Studio for Reiki Treatments and Courses from Sunday to Monday 9.00 a.m. - 8.00 p.m.
Silvia Camattari Reiki Master/Teacher. Member of the U.K. Reiki Federation.